Light-colored hardwoods like White Oak are making a comeback with the recent surge of Scandinavian style design. Tough, durable and neutral-leaning in grain tone, White Oak is one of the “old-faithful” types when it comes to North American hardwoods. The cells of white oak wood boast complex biological advantages that I won’t bother to explain here because …well, honestly because I’m just so sick and tired of copying and pasting from Wikipedia! These advantages make Oak highly water- and rot-resistant. For this reason, Oak has long been a popular choice for boatbulding, beer and wine barrels and home interiors. If you’re looking for a table to use outdoors, Oak is a safe choice. Stockton Heritahe White Oak furniture brings warmth and elegance to nearly any setting. Oak is a safe choice for nearly any style-conscious setting - whether your room is bursting with sunlight and bold modern colors, or if you gravitate towards a more nostalgic old-world aesthetic with earthy tones, white oak won’t do you wrong. .
All of our Oak is kiln dried to and hand finished to ensure a long tenure that withstands the wear and tear of everyday life. 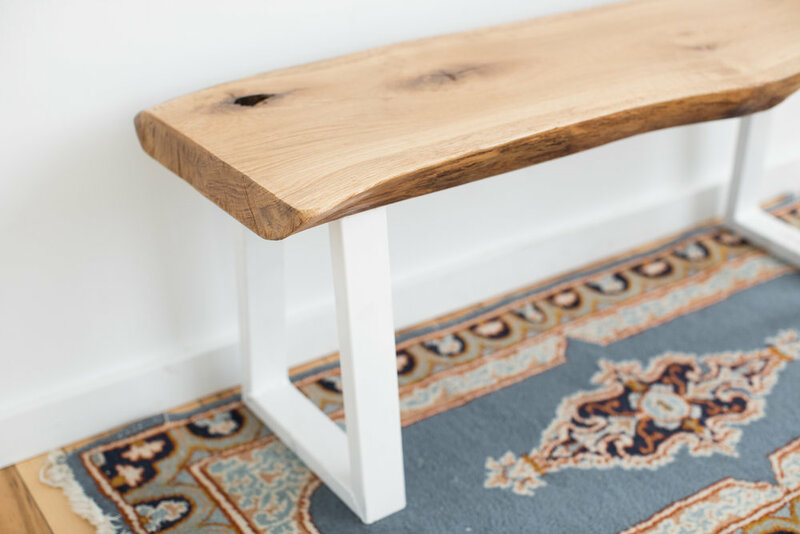 We offer a wide selection of white oak furniture - match the sleek clean modern Li nes of a white oak side table with a live edge Oak coffee table for a living room set. Or mix and match a piece of Oak with other hardwood species from our collection, such as Walnut, Monkeypod, or Maple.